At the edge of Kathmandu Valley’s urban sprawl in Dhapakhel, new houses stand adjacent to vacant farming lots. One of them belongs to Paras Pokhrel. From the outside, the Pokhrels seem like a typical modern family. The daughter is a dance teacher, the son is still in school, and father Paras owns a restaurant. But on 14 February, officers from the Central Investigation Bureau (CIB) raided their home after Lojung Kippa Sherpa reported that her three children were missing. Earlier in the day, she had filed a case against Bishwa Pratap Acharya, president of Happy Home Nepal (HHN), an orphanage in Dhapakhel. Pokhrel is Acharya's brother-in-law. In 2006, upon her sister’s insistence, Sherpa agreed to let her eldest daughter Mingma travel from Makalu, Sankhuwasabha to Kathmandu and stay at Happy Home. Son Ngima and daughter Phurpu followed in 2008 and 2010 respectively. The owners promised to not only feed and educate the children, but also help with the treatment of Mingma, who suffers from a disability. CIB had been interrogating workers at HHN since the early hours of Friday. When the police first questioned Acharya about the children’s whereabouts, he lied and said they were at HHN’s hostel. Later he admitted that Ngima and Phurpa were at Pokhrel’s house. But Mingma was still missing. Again Acharya tried to mislead the investigators and claimed she was with his wife Puja in Pokhara. He retracted his statement minutes later and said Baluwatar. Police eventually found her near Nawakiran Ashram in Hattiban. The Sherpa children have been living in HHN’s different hostels around the Valley with at least 70 others. All of them are registered as orphans or abandoned and donors from Czech Republic, Slovakia, and United Kingdom have been funding their education and upbringing. In January 2013, however, the same donors accused Acharya of fraud and child abuse and asked the Central Child Welfare Board (CCWB) to investigate. Since Acharya’s first brush with the law, testimonials from former donors, volunteers, and teachers have poured in. Seven months ago, another complaint was filed against him for hiding children from parents. It was then that Sano Paila, a Birganj-based organisation that works against child-trafficking in partnership with UK charity Freedom Matters, followed up on HHN’s activities. 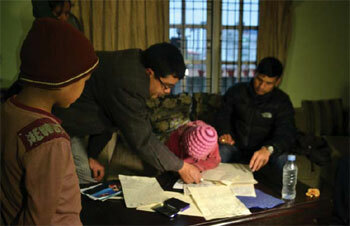 Kanchan Jha of Sano Paila insists that most of the children at HHN have parents back home. “He has been using Mingma’s disability to milk well-meaning donors for treatment money,” says Jha. When Lojung was reunited with her children at the District Police Headquarters in Jawalakhel on Friday, she found out that only Mingma could speak Sherpa. However, that was the least of her problems. Subsequent medical check-ups revealed the children were malnourished and suffered from body lice. Mingma was diagnosed with TB and is under antibiotic medication. The youngest girl told counsellors she had not been to school for two months. Police eventually arrested Acharya on fraud, kidnapping, and child-trafficking charges and he is now in custody. Since the investigation is still ongoing, the extent of fraud and abuse remains to be discovered. Puja Acharya is still on the run and it hasn’t yet been confirmed if Paras Pokhrel is also an accomplice in the crimes. On Sunday, police rescued another girl from HHN. The home is currently being run by a management committee that, without the Acharya couple, is struggling to take care of the children. SP and CWISH (Children-Women in Social Service and Human Rights) are now seeking permission from the National Human Rights Commission and CCWB to rescue and rehabilitate the remaining children from Happy Home. Names of children have been changed.